I’ve been fortunate enough to meet a lot of people who like to get outdoors and have a great day on the water and living in Florida, that’s a bonus! Like clockwork every year the migration of retired northerners make their way to the Sunshine State. They clog the roadways, pack the local cafes and hangouts. Not all is doom and gloom. The economy picks up putting some extra funds in the bank. I happened to strike up a conversation about fishing with a few of the guys at the local bagel shop. They have different backgrounds but all like to fish, therefore it was fitting that I join in. After a week or so I was able to set up a trip with Bill from New York. He likes going offshore but showed interest in fishing inshore for snook, trout and reds if we could find some. I decided to take him to several local spots. The bite was off, and I mean off. I saw plenty of trout, one really nice red, and a lot of snook, but they all had lockjaw for some reason. This being the first trip I really wanted to catch some fish so he could experience what inshore fishing is all about. By the end of the day I caught a few small snook, one bluefish and a ladyfish. Bill caught one or two small jacks and that was it. I figured he was done inshore but to my surprise he had a great time and was looking forward to a redemption trip. Now for the second trip on a drizzling morning, the weather was touch and go for the entire day. Of course, we started out at breakfast and then headed to Bass Pro Shop. 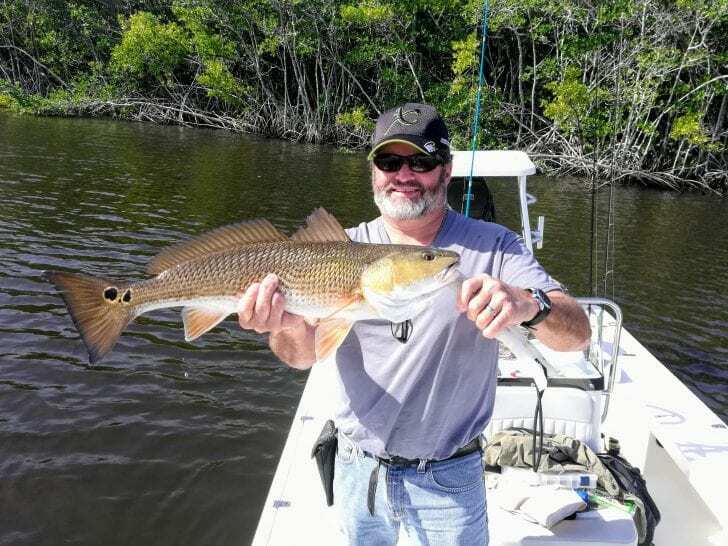 I said forget about Bass Pro, lets fish in the North Fork of St. Lucie River where we can hide from the wind, chill under a bridge if it rains and probably catch a bunch of juvenile snook, snappers, Mayan cichlids, etc. Well the drizzle turned to full rain while we were cruising a mangrove shoreline catching snook after snook; all pretty small. Bill was having a blast, fully understanding why I love inshore fishing. If you’ve never fished the North Fork it’s like a mini Everglades trip without getting lost. We went south and it was on!!! Double hookup and I had a nice just under slot snook on the line and Bill didn’t know what he had yet. I landed and released my fish quickly so I could help him out as his fish was taking line and putting up a fight. As the fish came closer to the boat, we realized he had a really nice redfish. We landed the red and it was a very respectable fish and would’ve held its own even in Louisiana. It measured 26 ¾ inches and Bill’s biggest red caught on artificial. Now he owes me a smallmouth trip in upstate New York, and I’ll be an outsider!! !